Twenty Knights, Dames, and Auxiliary of the Order of Malta help Birth Haven provide shelter, support and education for homeless, pregnant women and girls. Our members work and support various fund raisers throughout the year and volunteer in the life-skills program. C.O.P.E. 2 is a continuation of the C.O.P.E. Program, where members mentor adjudicated youth between the ages of 13 and 19. A New Jersey Area Member mentors youths as well as holds regular meeting with social service partners, representatives of the judiciary, parole officers, social service agencies, and the Camden ministry. A New Jersey Area Order Member serves the dying and their caregivers within their homes or at an inpatient hospice facility during the last months, days or hours of the patient’s lives. This member offers emotional support and companionship to the dying patients and family and respite to the caregivers. They also assist with errands, childcare, and household chores. 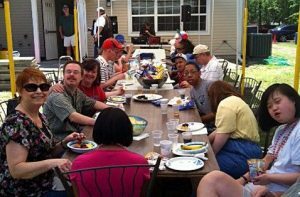 The Discovery House is a spiritual center for families of children with special needs, the chronically ill, inner city children and adjudicated youth. Members of the New Jersey Are provide a variety of services and spiritual support to those in the Discovery House. Ninety Knights, Dames, and Auxiliary fully staff St. Ann’s Soup Kitchen one Saturday every other month. This soup kitchen serves the homeless and marginalized segment of the Newark population. Members provides lunch and dinner to 175 to 225 individuals in a Christian Catholic setting. St. Ann’s Soup Kitchen also provides groceries from its pantry three times a month. 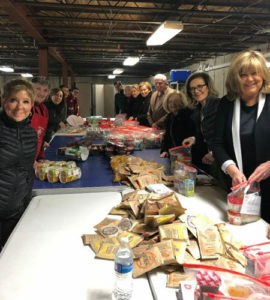 Members gather at Christ the King Church, New Vernon, once a month to fill 240 backpacks of non-perishable food items for three- to five-year-old youngsters. The bags are then transported to a Catholic Charities daycare center in Paterson where they are distributed to the children at the end of the month when family food stamp benefits may run out and supplemental nutrition is required. Seven Knights, Dames and Auxiliary together with two Chaplains of the Order participate in this work. Knights for Christ the Healer through its mobile outreach team assists veterans with obtaining information and initiating compensation claim processing in conjunction with the Military Order of the Purple Heart. The organization performs an educational role, raising public awareness of existing services and benefits that are available to veterans. In addition, the organization perform minor housing repairs, painting, etc. to the residences of the severely wounded and disabled veterans. The organization is in the planning stages of creating a foundation that would award partial scholarships to children of combat wounded veterans with a less than 100% disability. Each year the organization organizes an Annual Mass of Appreciation, Honoring members of the US Armed Forces & First Responders. A member in the New Jersey Area, through Men’s Senior Outreach, provides support to men of charity involved in the Parish, the military, outreach programs, and youth ministry projects. Two members of the New Jersey Area work at pregnancy aid center in Raritan, New Jersey passing out supplies and contribute financial support. They provide and distribute diapers, wipes, clothes etc. to women with babies who qualify with W.I.C cards. A member of the New Jersey Area celebrates Mass and brings the word of God to our incarcerated brothers and sisters in the Morris County Jail. Approximately four Knights, Dames, and Auxiliary participate in various educational programs that support pro-life issues to the Church, Area Members, children, and prayers for the sick. They participate at the Respect Life Mass in Newark, NJ, March for the Unborn in North Arlington, NJ, and the March for Life in Washington, DC. Members also educate a local Pastor and his fellow clergymen on pro-life issues, attendance at the Respect Life Mass, Newark NJ, attendance at the annual March for Unborn in North Arlington, NJ, coordination with articles on pro-life for the New Jersey Area newsletter, for the sick and deceased, and educating of children on the Catholic view of human sexual development. 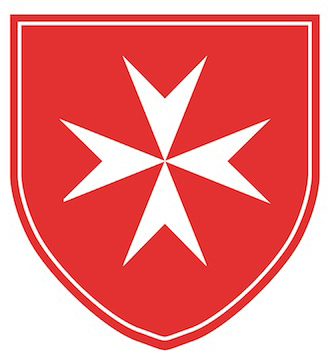 Six Knights and Dames of the Order of Malta support Several Sources Shelters. Several Sources Shelters began in 1981 by a Dame of the Order in her own home as a shelter for pregnant women until they could “get on their feet”. The organization now has three active maternity homes in NJ, in addition to a Daytime Shelter in Newark, NJ called “Ladies Rest” for women who are homeless, sick and elderly and need help to restore their dignity; they also have a sonogram center in Englewood, NJ. All Several Sources mothers are taught chastity and if necessary, will receive the organization’s support until their “saved” baby is 18 years old. One member of the New Jersey Area Order is a Trustee in fundraising activities for the Somerset Medical Center Foundation. They raise funds for the medical center to provide charity services for those in need.